A leaking water heater may seem like just a minor nuisance, but it can quickly turn into a big problem. Even a small amount of water can cause damage to your floors, sub-floors, and walls. When your water heater is leaking, it may be a symptom of a much larger problem. In extreme cases, a catastrophic and complete water heater failure can cause a significant flood that could lead to hefty repair bills and damaged personal property. Water heater leaks can also be a health concern. Damp and wet areas can sprout mold and mildew that may cause some people to experience allergic reactions and asthma. According to the EPA, some mold spores are toxic and can lead to serious health problems. Not every small puddle of water found at the base of your water heater is due to a leak. Condensation can form on the pipes and appliances surrounding your water heater. As the condensation accumulates, it'll drip and pool on the floor. This is especially common in basements, or during damp weather. Dry the area and try to determine the cause by inspecting the water heater and plumbing fittings for obvious signs of water leakage. If none is found, inspect other nearby possible sources. Water faithfully obeys the laws of gravity, so pay particular attention to anything directly overhead, especially water pipes. If still nothing is found, place some paper towels after you dry the floor. Check the towels every few hours for signs of leakage. If after a day or two, the problem doesn't re-appear, it's likely nothing to be concerned about. However, if water reappears, and no other source can be found, there's a good chance it's your water heater. Once you determine that your water heater is leaking, the first thing you need to do is turn OFF the power supply. If you have an electric water heater simply locate your circuit breaker box and switch OFF the breaker to your water heater. Water and electricity can be a dangerous combination, so it’s important you do this before moving forward. If you have a natural gas water heater, there should be an on/off switch or dial on the exterior of the tank near the bottom. Make sure it is set to OFF. Avoid closing the gas shut-off valve if possible. These valves can be finicky and susceptible to failure over time, so it's best that they be left alone. WARNING: Water heaters are typically factory-set to heat water to 125 degrees Fahrenheit, which is hot enough to inflict first degree burns on skin on contact. When turned all the way up to maximum temperature (which can be anywhere from 160 to 190 degrees Fahrenheit) serious injuries can result from even indirect contact with the water. Always take precautions to avoid coming into contact with heated water. If the leak is obvious and significant, turn OFF the water supply at the cold water shut-off valve. The majority of water heaters will have a valve located above the water heater to shut off the water supply. 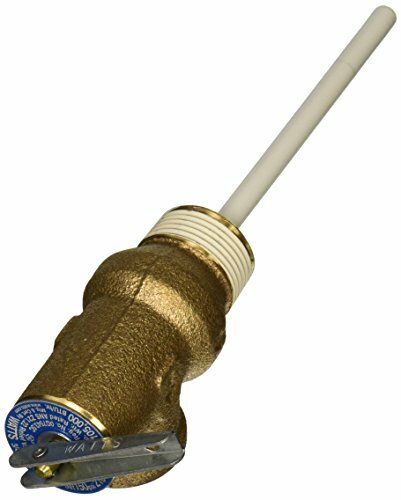 The cold water shut-off valve will either have a handle to pull down, or a gate valve (essentially a dial) that can be turned clockwise to close the valve. Do NOT close the valve if you can not reach it safely without coming in contact with water. If you have a large, serious leak and can't reach the incoming cold water shut-off valve safely, then you'll need to locate the main shut-off valve to your house. Closing the house's main shut-off valve will shut down all water coming into your home, as well as the water supply to your water heater. Shutting OFF the water supply should at least slow the leak down. It might even stop the leak entirely depending on where it's coming from. However, you should keep in mind, it might be necessary to turn the water supply back ON to help locate the leak if you're still unsure of it's source. Check the points where the inlet and outlet pipes connect to the water heater at the top of the unit. If this is the location of the leak, the fix may be as easy as tightening a few loose connections with a pipe wrench! Every water heater has a temperature & pressure relief valve located on the side (or top) of the tank. The valve should have an attached pipe that runs down to the floor. The T&P Valve is a safety device that's in place in case the water within the tank becomes too hot, or an excessive amount of pressure has built-up and the tank is in danger of bursting. The T/P valve will relieve the tank pressure by allowing some of the water out of the tank. First, inspect the point where the T/P valve enters the tank for signs of a leak. Then, inspect the valve itself. If the T/P valve is in the closed position and water is flowing from the attached pipe, the valve is defective. If the valve is in the open position, it may be relieving excessive pressure from inside the tank (which is forcing the valve open). If this is the situation, the leak is generally fixable, but it should be taken very seriously. It's a good idea to call a professional. The drain valve is located near the bottom of the tank. Check that its completely closed. Also check where the drain valve enters the tank. It should be watertight, with no signs of moisture. A leak from the drain valve is not a serious problem and can be fixed. A water heater's internal tank is wrapped in insulation and then enclosed within an outer skin. If the internal tank is leaking, it won't be visible from the outside, and water will most likely escape from the bottom. Unfortunately, it's not uncommon for the internal tank to start leaking. The cause is typically due to age and deterioration. If the source of your leak is the internal tank, the only fix is to purchase a new water heater. As stated above, when a water heater leaks it can be a serious problem and action needs to be taken as quickly as possible. Depending on the type of leak, you'll either need to repair or replace your water heater. In both cases, it's highly recommended that you call a professional plumber. When you call a professional plumber they'll be trained and prepared to handle any issue they encounter. They'll even get rid of your old water heater for you. If you're replacing your water heater, you may want to consider moving to a tankless system. If the problem appears to be minor, and you have experience doing your own home plumbing repairs, you may choose to fix your water heater yourself. In this case, your next steps will depend on the source of the leak. WARNING: Repairing water heaters can be difficult. Improper repairs of a water heater can cause larger leaks, and even floods which could lead to more serious issues. If you do not have experience performing home plumbing repair, it's highly recommended that you call a professional plumber. If you have a leak coming from the area where the cold water inlet or hot water outlet connect to the water heater, you may be able to fix it by tighten the loose connection with a pipe wrench. However, if this does not solve the leak, you should contact a plumber. A leak from the temperature & pressure relief valve (T&P valve) may be caused by overheating or excessive pressure inside the tank. When the T&P valve is under pressure, the valve will open to allow water to escape, and thus, relieve the pressure. To check if this is the problem, reduce the temperature by lowering the thermostat setting. Then turn the water and power/gas to your heater back ON and observe the valve. If it continues to leak, shut everything off immediately and call a professional. If you determine that the cause of the problem is not excessive pressure or overheating, then you may have a faulty T&P valve. Place a bucket or container under the T&P discharge pipe and open the T&P valve by pulling the valve tab up so it’s pointing straight out. Doing this will flush out the valve and remove any debris that may be causing it to work improperly. If after flushing, it's still leaking, you'll need to replace the T&P valve with a new one. WARNING: NEVER plug the temperature & pressure relief valve to stop a leak. This valve is an important safety feature on your water heater. Plugging the valve will void all warranties on your water heater. But, more importantly, it could cause your water heater to explode! Before replacing the T&P valve you’ll need to drain your hot water tank. If you’re unfamiliar with how to do this, this article will help: Water Heater Maintenance: How to Maintain Your Water Heater. You won't need to completely empty the tank, just make sure that the water level is below the valve. To check this, simply open the valve. If no water comes out, then the water level is below the valve. Once the tank has been drained, go to a sink or bathtub and open the faucet on the hot water side. This allows air to enter the tank. Using a pair of channel locks, grab the T&P valve and turn it counter clockwise (to the left) until the valve comes off of the tank. Wrap the threads of the new T&P valve with Teflon tape to help seal and prevent future leaking. Be sure to wrap the Teflon tape tightly and work it into the grooves. About 4 or 5 wraps should do the trick. Screw the new T&P valve into the water heater using a pair of channel locks. Turn the cold water back ON and allow the hot water tank to refill with water. Do NOT turn the power to the heater back ON until the tank is full. The tank is full of water when water begins to flow at a full stream from your open sink or bathtub faucet. It's now safe to turn the power to the water heater ON. Attach the discharge pipe to the new T&P valve. This will ensure that any hot water that is released by the valve will go down to the floor, instead of spraying outward. If you notice water is leaking from the threads of your T&P valve, then there might be a bigger problem. Follow the instructions above to remove the valve, then check for signs of rust or corrosion on the tank. If there's any rust or corrosion, your water heater will need to be replaced. If the tank appears to be in good condition, wrap the threads of the T&P valve in Teflon tape and screw it back into the tank. Observe your water heater for a period of time to see if this solves the problem. Another cause of a leak from the T&P valve could be high water pressure in the municipal system or some sort of backflow preventer around the water meter or main shutoff. If you remove your T&P valve and see no signs of corrosion inside the valve it's possible this is your problem. You’ll need a licensed plumber to diagnose and handle these more serious problems. When a drain valve leaks it's generally one of two things. It could be caused by debris inside the valve or the valve itself may be faulty. Place a bucket under the valve and turn the dial counter-clockwise. This will open the valve. As the water flows out of the water heater, it should also flush out debris. If it's still leaking after flushing, the valve is faulty and it'll need to be replaced. The tank will need to be completely drained in order to replace the drain valve. Follow the same steps outlined above for replacing the T&P valve to drain the tank. If it's been awhile since you've flushed your water heater tank, it's possible that your drain valve will clog. In which case, you'll need to address the clog first. Unlike the T&P valve, the drain valve is not a safety feature. 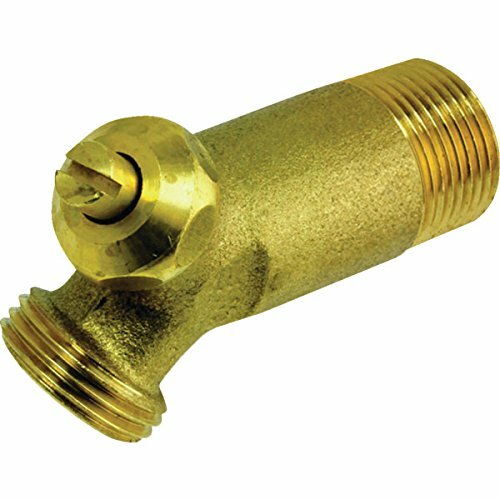 If you're unsure about replacing the valve yourself or don’t have time to get to it right away, you can simply buy a brass garden hose end cap and screw it onto the valve threads. This should stop the leak until you're able to address the drain valve. If your water heater is leaking from the bottom of the tank it suggests that there's a serious internal problem. Do NOT attempt to disassemble your water heater and perform internal repairs. Internal tank leaks can not be repaired and the water heater will need to be replaced. If you're unsure that this is your problem, you should call a licensed plumber. A leaking water heater can be a symptom to a more serious problem, so it's important to always keep a close eye on your heater after performing any repairs. If after attempting to fix the problem your water heater is still leaking, turn OFF the power and cold water supply and contact a professional plumber.